Infamous Kentucky county clerk Kim Davis had the full-throated support of Republican governor Matt Bevin – until it was time to pay the bill for her lawlessness. Now the governor’s attorneys are telling the court that the state shouldn’t have to pay for Davis’ decision not to do her job. Bevin’s lawyers say Davis should pay the nearly $225,000 owed to the couples’ lawyers to force the clerk’s office to issue marriage licenses. They say her “conduct that violates civil rights” was the reason why the lawsuits were brought and she acted without state sanction, therefore she should be held responsible. “Her local policy stood in direct conflict with her statutory obligation to issue marriage licenses to qualified Kentucky couples. The local policy also undermined the Commonwealth of Kentucky’s interest in upholding the rule of law,” Bevin’s attorney, Palmer G. Vance II, wrote. Davis went to jail for several days for contempt of court charges after refusing to follow a judge’s decision that she was required to do so. Kentucky voters booted her out of office in the last election. To support Davis’ crusade, Bevin’s office cajoled state legislators into removing the clerk’s name from marriage certificates. A district judge ruled in 2017 that the state should pay the plaintiff’s legal expenses. Bevin has appealed the decision; a three-judge panel will hear arguments later this week. In the ruling, the same judge said that since the plaintiffs had prevailed, the state must reimburse them for their legal costs. Her authority came from the state, she could have faced criminal charges for misconduct, and the state legislature could have impeached her. Instead, Governor Bevin called her “an inspiration… to the children of America” and the legislature changed the law to accommodate her. Therefore, the judge ruled, the state is responsible for her conduct. 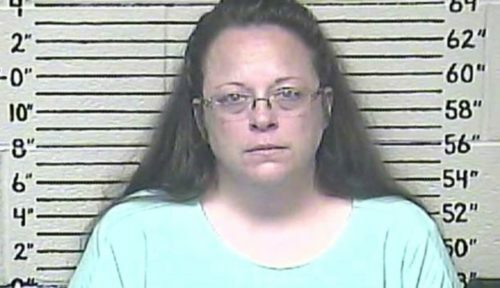 “Davis represented the Commonwealth of Kentucky when she refused to issue marriage licenses to legally eligible couples. The buck stops there,” the judge wrote in his decision.